Thank you Barlean’s for sponsoring today’s post. As always, all opinions are my own. I can’t believe that we are ending another year. Where has 2016 gone? 2016 was a really good year for our family; my husband purchased the business he has long worked for, we found out we were expecting our second child, and I was a brand ambassador for quite a few amazing companies. One of the companies that I recently joined forces with is Barlean’s. Have you ever heard of them? They are a family-owned natural foods company. I partnered with them earlier in the year with Stonyfield when I made my flax chia coconut yogurt chicken strips, and instantly fell in love with their products. I’m so excited to partner with them in 2017! They challenged me to bake something up in the kitchen with their Butter Flavored Coconut Oil. Yes, that’s right it’s coconut oil that tastes and smells like butter. If you were blind folded and someone put both in-front of you to smell you would have no clue which one was the real thing! You can sub out traditional butter 1 for 1 ratio with the butter flavored coconut oil for baking, cooking, and frying under 375 degrees Farenheit. The dairy free Butter Flavored Organic Coconut Oil offers all the healthy benefits of organic coconut oil, with the rich taste of butter. Great on toast, popcorn, baked potatoes or cooked vegetables, it’s also a perfect for baking and sautéing, too. It’s Certified Organic, Vegan, Non-GMO Project Verified, and contains No Dairy, Gluten or Soy. So after I learned about the product I thought long and hard about what I wanted to make with it, and in the end I opted to make my Pear Tart Tatin. It’s a simple recipe that is perfect for entertaining! I love pears, and find that I don’t cook with them often enough. I challenged myself to cook with them a little more in 2016 and have found that my husband is now also starting to like to eat them. A win-win for me. 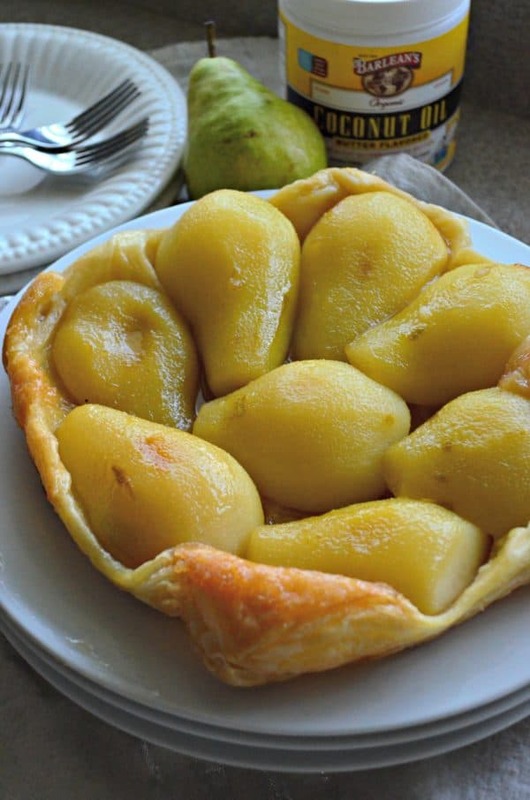 A tart tatin is a perfect way to cook with pears for those who aren’t a huge fan. 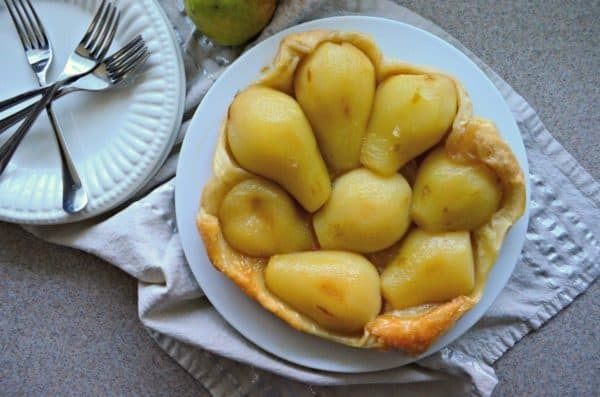 Yes, you are essentially eating a half cooked pear; however, it’s soft and candied and has a layer of delicious puff pastry. You simply can’t go wrong! It’s an easy 4-ingredient dessert that looks very impressive–yet no one will know you weren’t slaving over the oven making it. It’s essentially an upside down tart. 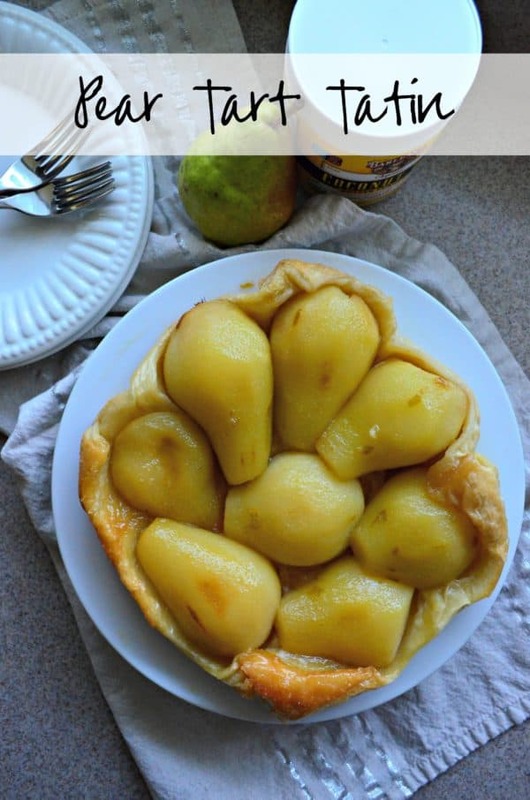 I love this recipe for Pear Tart Tatin because you can make it on the fly if you have guest stop by. As long as you have a sheet of puff pastry in the freezer and a few pieces of fruit (pears, apples, even peaches work great), you are in business. So let’s talk about how you make the Pear Tart Tatin. First, you’ll melt the Butter Flavored Coconut Oil, once it’s hot you add the sugar and then add in the peeled, cored, cut pears to the skillet. 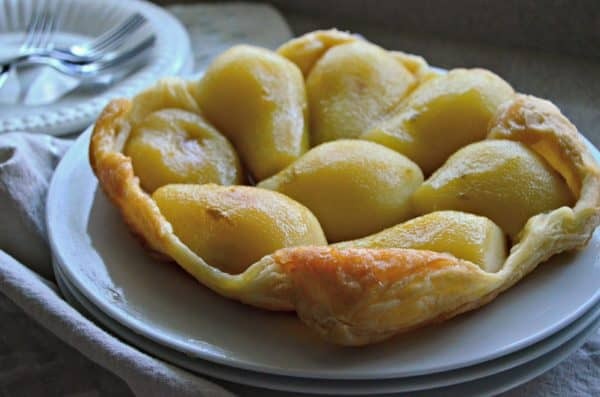 You let them cook for a few minutes until you notice the coconut oil/sugar mixture is starting to turn brown then you carefully lay a sheet of thawed puff pastry on top of the pears and tuck in the sides. In the oven it goes to bake and get golden brown. That’s it! I told you–this is the most simple yet elegant dessert recipe. Your friends and family will be requesting Pear Tart Tatin for years to come. In a large cast iron skillet, melt the Barlean's Butter Flavored Organic Coconut Oil over medium-high heat. Peal, slice the pears lengthwise and core pears, place to the side. Once it's hot sprinkle in sugar. Add the pears to the skillet cut-side up, so that the rounded edge of the pear is on the bottom of the skillet. Cook until sugar begins to turn light golden brown. Top the pears with a sheet of puff pastry tucking edges into the pan. Transfer the skillet to the oven and cook for 25 minutes or until pastry is golden brown. Let the tart rest for 10-15 minutes once out of the oven. Then, place the serving side of a larger flat platter or plate over the skillet (plate needs to be larger than the skillet). Carefully flip platter and pan to reveal tart. Cut and serve immediately. *Be careful when flipping the tart out of the skillet as juices might still be in the skillet and could splash. I suggest having a second person to help with the flip.